Cooperation with EESTEC – EUROAVIA München e.V. March 2017, the local boards of EESTEC and EUROAVIA met for the first time to discuss a possible collaboration between the two societies with the aim to increase interdisciplinary teamwork among students. EESTEC (Electrical Engineering Students’ European Association) and EUROAVIA share similar goals in two different sectors whose collaboration has become inevitable. During this meeting two ideas emerged, that are now further developed during the summer. With the support of the EUROAVIA Internal Training System (EITS) and the EESTEC Training System we plan a joint soft skill training for members of both societies. This training aims to give students of either discipline the possibility to strengthen their skills, get to know each other, and exchange experiences and ideas. For this purpose, EESTEC trainer Lida Kosti and EUROAVIA trainer Adnan Muslić will prepare an exciting day of activities. The event will likely take place in July. 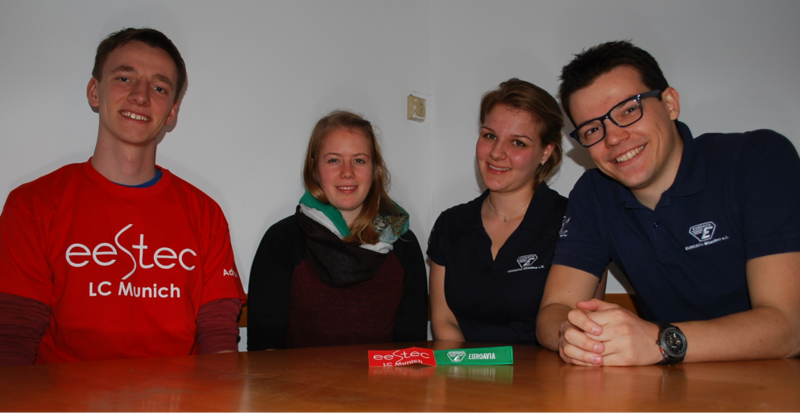 The second idea discussed was the possibility of organising a joint international event, a chance for local groups of both societies from all over Europe to meet in Munich and learn about an interesting topic. The topical event will concentrate on an issue that is relevant to both electrical and aeronautical/aerospace engineering students. We are looking forward to working with EESTEC!